I've been doing Weight Watchers for about 2 weeks now. According to my wonky scale, I've lost right at ﻿3lbs. So far, so good! It's actually not as bad as I thought it would be. I'm still eating yummy food, I am just really paying attention to portion size. I was really hungry at first (guess that means I was snacking too much before??) but that has gotten better. The WW app on my iPhone is a lifesaver. I also downloaded Dottie's app thanks to Kristy. It has TONS of menus from restaurants & it has made my desire to eat out dwindle. I looked up all of my favorite restaurant meals and most of them are worth a full day of points! yuck. I'm trying to make smarter choices about eating out...it's hard since I would LOVE a big bowl of queso & some cheese enchiladas right now! or always. whatever. I've been trying lots of new recipes that are WW friendly so I wanted to pass them on! (click on the pinterest ones for the recipe) I love, love, love Skinny Taste. The first few recipes are from her blog! Baked Potato Soup. Y'all, this is SO good! I ate this for lunch all week & never got tired of it. It took like 20 minutes to make...even better! I made Ben, pickiest eater ever, try it & he liked it. 2 thumbs up all around! Skinny buttermilk mashed potatoes. These were so good that Ben didn't even know they were healthy. (hey, hubs!) These will be my new go-to mashed potatoes! This spinach salad is SO good and perfect for the fall. It has roasted butternut squash, dried cherries (I used craisins because they were on sale), pumpkin seeds, and gorgonzola with a homemade balsamic/dijon dressing. I also ate on this for a week! I'll type this one out because I'm just nice like that. The things in bold are what I tweaked a bit. If you read my answers from earlier this week, you know that LOVE mexican food. I could eat it every single day. My guilty pleasure food is the mexican pizza from Taco Bell. No judgement please. I got really excited when I saw this recipe on the Weight Watchers website. mexican + pizza?! Can't go wrong! This was yummy & guess what? I ate it for dinner all week! Notice a trend yet? 1/2 cup(s) cilantro, fresh, chopped, divided -- fun fact: a HUGE bunch of cilantro is only 99 cents at Publix! Place tortillas on prepared pan; bake until crisp, about 6 to 8 minutes. Meanwhile, coat a large nonstick skillet with cooking spray; heat over medium-high heat. Add chicken, garlic, cumin and salt; cook, breaking up chunks of chicken with a wooden spoon, until cooked through, about 4 to 5 minutes. Meanwhile, in a medium bowl, toss together tomato, avocado, remaining 1/4 cup cilantro and lime juice. 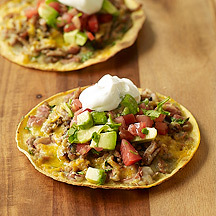 Remove pizzas from oven and top each with 2 teaspoons reduced-fat sour cream and about 1/4 cup avocado mixture. Yields 1 pizza per serving. This was an awesome dinner all week & is really filling. The kicker? It's worth 6 points with the new WW system. Okay, go ahead and add these to your weekly menu! They are all great! All of these look SO good! Post-wedding pounds have been piling, haha, and I have been looking for some healthy-yet-still-husband-pleasing recipes to try. Thanks for posting these links. I'm always looking for new healthy recipes to try! Have a great weekend.